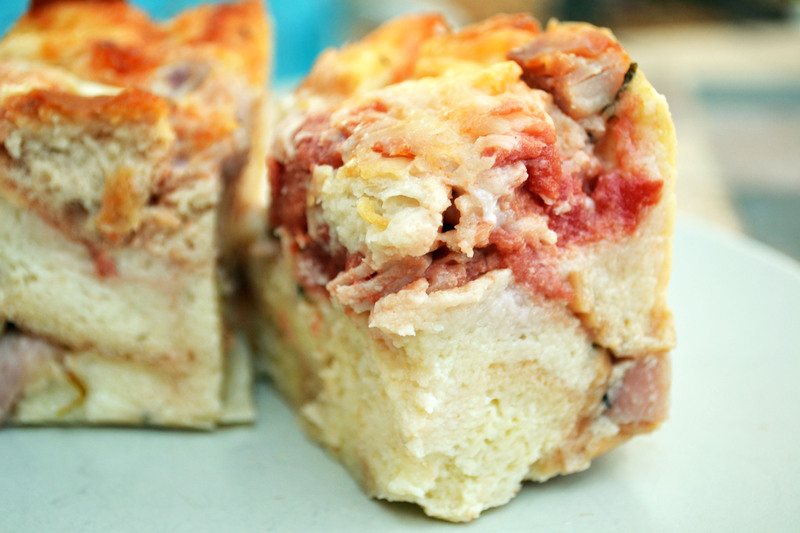 Need an easy breakfast casserole to feed a hungry brood? I took this for breakfast to work on friday. I think it will make a great breakfast for a holiday morning. This is an adapted Martha Stewart recipe. It is called a strata (not because it sounds pretentious) because you layer the ingredients in the pan…get it… stratification…layers…ya, this is a geologists casserole. Sorry, science humor. So the great thing about this strata (say it and hold your pinky up too, you’ll feel special) is that you can throw it all together the night before and then bake it in the morning. Love it! Like a lot of casseroles, you can swap different cheeses, add veggies, throw in more or less meat (queue gasp from Texas). For the bread filling, I used a long fresh loaf of french bread from a local bakery. You could also use any soft good white bread (italian or ciabatta). My only issue was that it was a bit “bready” for my taste, but plenty of coworkers liked it. If you like bread, you’ll love it, but if you are like me and want more EGG, then I recommend reducing the quantity of bread (only use 1/2 to 3/4 of the loaf) and reduce the milk by 1 cup (use 3 cups instead of 4 cups). Spray a 9-by-13-inch baking dish with nonstick spray. Arrange half of the diced bread in the bottom of the dish. 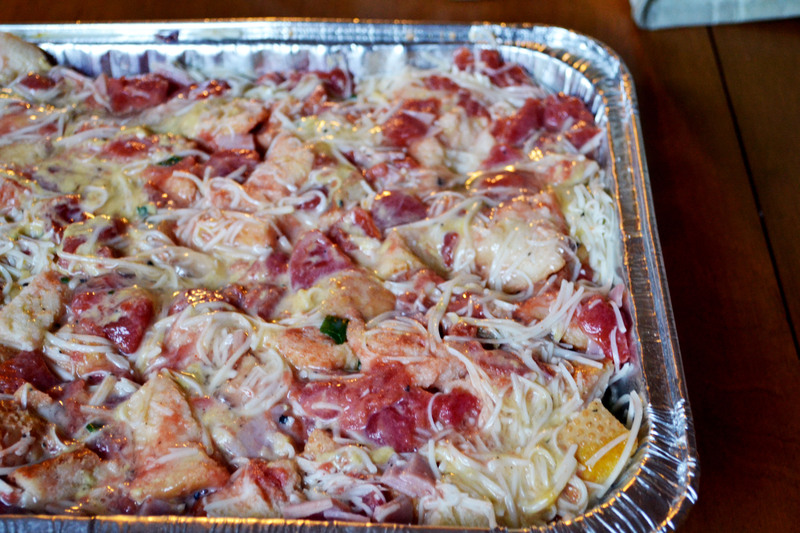 Sprinkle half of the ham, cheese, green onions, and chives evenly on top of the diced bread. Add another layer of bread and top this layer with the remaining ham, cheese, green onions, and chives. Arrange and spread the diced tomatoes on top of the casserole. In a large bowl, whisk the eggs, egg whites, milk, mustard, smoked paprika, salt, and pepper until combined. Pour this egg mixture over the casserole layers. Preheat oven to 350 degrees. Pull the casserole out of the refrigerator 30 minutes prior to baking so that the casserole can come to room temperature. Bake casserole uncovered until golden and fluffy, about 60 to 70 minutes. It will be done when you insert a knife and it comes out clean. Let stand 20 minutes before serving. ENJOY!